My blog about the granting of senior citizen’s discount on tricycle fare received many responses when I posted a link to it in my Facebook Timeline and Groups. Most of the comments I received concerns the non-granting of discounts to senior citizens and students plus overcharging by the drivers despite having the authorized tricycle fare rate matrix (“Taripa” in local parlance) in each unit plying our city streets. On the issue of overcharging, I wish to present an easily understandable way of computing the right tricycle fare in this article. 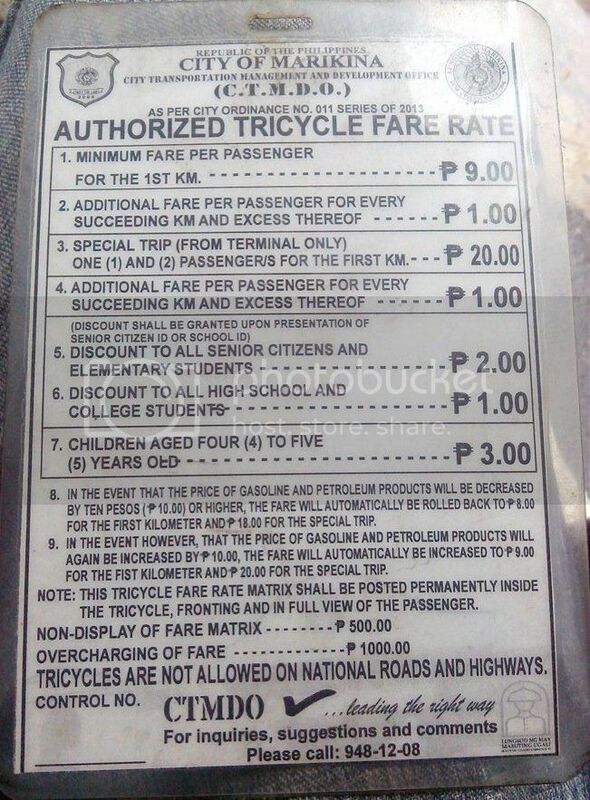 The following discussions on the rates and amounts that passengers should pay when riding tricycles in our city are based exclusively on the Taripa (see the attached image) issued by City Transportation Management & Development Office (CTMDO) in accordance with Marikina City Ordinance No. 011, Series of 2013. The city ordinance does not have a section on the definition of terms so I just take Items 1 and 2 in the Taripa to mean as Minimum Fare per passenger at ₱9.00 for the first kilometer and the additional ₱1.00 per succeeding kilometer which are chargeable only when someone takes the ride anywhere within the authorized zone but not on a designated tricycle terminal. There should be no conflict on charging the regular fare if the trip is within the designated zone of the tricycle. However, if the destination of a passenger is outside the designated zone, conflict may arise. In such a case, it can be considered and charged as Special Trip but this is not covered in the ordinance. Item 3 in the Taripa covers the Special Trip (From Terminal Only) with one (1) or two (2) Passengers for the first kilometer costs ₱20.00 and the ordinance did not say if Item 2 will apply after the first kilometer. So, for the purpose of computing the fares on Special Trip covering a distance of more than one (1) kilometer, I assume that the ₱1.00 per passenger will apply; however, for the sake of fairness, the fare for two (2) passengers is charged even if the passenger is alone in the trip. This means, the distance in excess of the minimum one (1) kilometer in a Special Trip will be charged at ₱2.00 per kilometer. In the responses I got in my posts at Facebook, fares being demanded by tricycle drivers go as high as ₱50.00 for a single passenger on a Special Trip. That is absolutely a case of overcharging which according to the ordinance is punishable by ₱1,000.00 fine. Had anyone tried to bring up a case of overcharging to CTMDO? Don’t look at me, I always get to pay the correct discounted Senior Citizen’s fare whenever I rode a tricycle. In my next blog, wait for my suggestion on how to know the distance you will travel when riding a tricycle in our city. This is very important for us to know how much to pay the drivers of the tricycle we ride. I shall also include in the discussion various matters that I would like to bring to the attention of CTMDO. Watch for it. Great blog! Very helpful and informative. Many tricycle drivers around the city are so crass and rude and tend to intimidate female passengers by appearing boorish. Many have been overcharging me and my kids whenever we take the tricycle and often, I find myself paying what they demand for fear that they might hurt us. But there are those who are respectful and courteous. To those drivers, I always add up to 10 pesos on the fare for their kindness. Regarding those who overcharge, I called CTMDO about this and they were very helpful in confirming that I have been overcharged and that fare rates have not yet increased since the latest ordinance. Thank you for the visit and the feedback. Your actions are indeed commendable. The tricycle drivers won’t be able to overcharge us if we would only insist the provision of the ordinance and I believe CTMDO would be fair enough to decide on cases that will be brought to their attention. I just came back from a discussion about overcharging with three tricycle drivers at the offices of the CTMDO today. It was a very enlightening discussion and I commend the CTMDO personnel who handled the case. They were very accommodating and patient when it came to explaining the ordinance to the drivers. 1. The contention really is on the charge per succeeding kilometer. Although the drivers in question understand the minimum rate, they charge differently for every additional kilometer. One charges as much as 10 pesos! 2. Distance traveled is arbitrary as well. Their estimate of the distance from point A to B is really… amusing, to say the least. They only had a modicum of an agreement when I showed them distances from Google Maps. 3. The current rates are being contested by the TODAs despite the ordinance being in place for over a year now. As a result, the rates for some “indefinite” destinations in the city (read: If the driver feels the destination is “too far.”) are pretty much negotiable. The third item is what concerns me most because even the CTMDO doesn’t have a clear stand on this. So, Ed, perhaps you could clarify this for us when you get to hold talks with CTMDO? Thanks as always. Hi Jacques, I really appreciate your feedback on how CTMDO handles complaints of overcharging by tricycle drivers in our city. I am not surprised that the drivers do not know exactly the distance travelled when they ferry passengers from one point to another point. I also believe that most passenger do not the information; hence, overcharging is always bound to happen. The solution is for CTMDO to prepare a matrix similar to what LTFRB issues to PUJs. Anyway, I will bring up our suggestions when I get to meet with CTMDO people which never happened yet because I had not experienced getting overcharged. I am even always getting the ₱2.00 discount as a senior citizen.